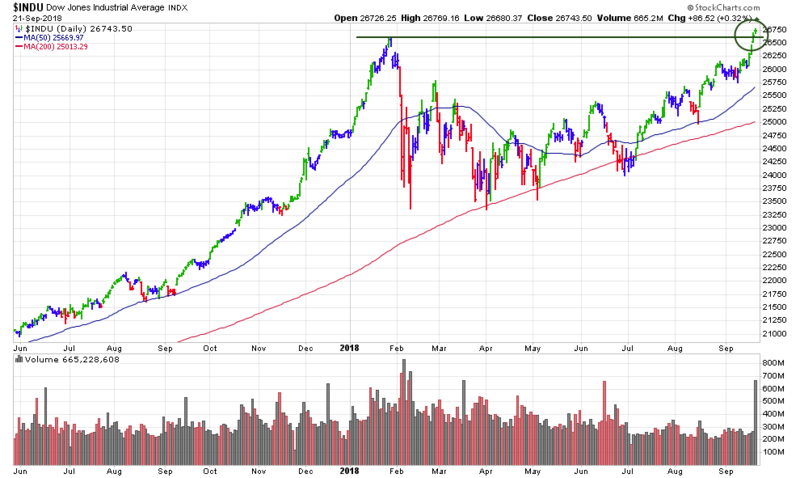 This past week the Dow Jones and S&P 500 made new record highs, while tech stocks lagged once again and dragged the Nasdaq lower. For the week, the Dow closed up a solid +2.2%, as the S&P 500 gained +0.9%, while the Nasdaq lost -0.3%. The blue chips posted their biggest weekly point gain in 3 1/2 months. Both the Dow and the S&P recorded their second straight weekly gain, as well as their 10th positive week of the past 12. However, last week declines in mega-capitalization technology and internet-related stocks weighed on the broader market, and pressured the Nasdaq. The index is on track for a -1.5% decline in September. Big name stocks such as Apple Inc. AAPL, -1.08, Facebook Inc. FB, -1.86%, Amazon.com Inc. AMZN, -1.51%, Alphabet Inc. GOOGL, -1.63%, GOOG, -1.75%, and MU (reported earnings), -2.87% all finished sharply lower for Friday’s session. Industrial stocks have clearly started to lead the overall market, and we are in the midst of a sector rotation with this recent divergence in the major averages. Industrial, airline, financial and energy stocks fared well, joining health care among top sectors. Meanwhile, as noted, tech stocks are slumping. Overall markets have been grinding higher with a lack of any significant volatility for the past several weeks. The gains have largely been supported by improving economic data. This week, to add to that we had a reported jump in the Philadelphia Fed manufacturing index which was more than expected for September, and new data that suggested the U.S. economy could look forward to +3% economic growth in the second half of 2018. This is while inflation remains in-check, and that helps to keep significant intrests rates raises off the table as a continuous rise in rates will more likely kill – what is by some measures – the oldest in bull market in history, more than its age. The biggest concern continues to be looming trade wars between the U.S. and its global trading partners. However, even with Trump’s has announcement this week of nearly $500 billion in tariffs on Chinese goods, markets seemed little fazed. Keep in mind that the rise in volume that we witnessed on Friday was due to the simultaneous expiration of options and futures contracts which caused trading to swell well above normal levels. We had 2 breakouts this past week. Each has updated commentary below. I ran my regular stock screens and added 2 new stocks to our watch list this week.